Martin's dreadnought has become perhaps the archetypal acoustic guitar outline, and with 100 years of history behind its belt, Martin has seen fit to honour it with a documentary film. 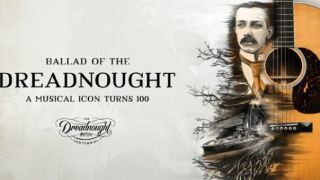 Narrated by actor and musician Jeff Daniels, the Ballad of the Dreadnought tells the story of the first dreadnoughts built in 1916 for the Oliver Ditson Company right up to today's limited-edition and artist models. The film features interviews with Martin CEO Chris Martin IV, as well as artists including Crosby, Stills and Nash, Steve Miller, Rosanne Cash, Vince Gill, Jason Isbell, Seth Avett and many more. The full movie is available to view now at Martin Guitar. For more on the dreadnought, have a read of our brief history of the design.